Region Found primarily in the northeastern, mid-Atlantic, southeastern and north central regions of the U.S.
Blacklegged deer ticks are a vector of anaplasmosis, (very bad for dogs). babeosis and Lyme disease (very bad for people). Lyme disease is a primary concern in the United States. 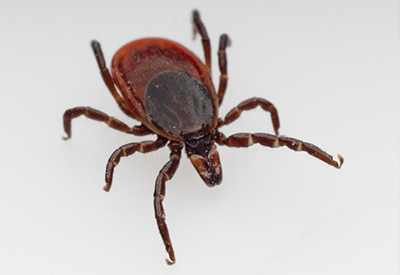 Symptoms of Lyme disease include fever, headache, fatigue and a characteristic bull’s eye-shaped skin rash. Lyme disease can also affect joints, the heart and the nervous system if left untreated. When in an area where deer ticks are common, wear long-sleeved shirts and pants, preferably light-colored so ticks will be easy to detect. It’s also important to wear a tick repellent containing at least 20 percent DEET. To get rid of ticks and their risks indoors, inspect clothing and skin when heading inside. If you find a tick, remove it with a slow and steady pull. Consult with a doctor immediately if there is a reaction at the bite site or if you believe you have contracted Lyme disease. To address ticks on your property, contact the professionals at ARREST-A-PEST INC.